Ursula with her children Hilaury, Joseph (standing), and Ignatz. Taken in Regensburg, Germany, in approximately 1879-80. This is one of my favorite photos for several reasons. First, it is the only photograph I have of any great-grandparent as a child. I just love the expressions on the children’s faces – not to mention their rather exasperated-looking mother. I can only imagine how long the photo session was and how difficult it was to get the children to be still. The back of the card identified the children – other than that smirk on Laury’s face, I don’t think I’d have recognized the others including my own great-grandfather. It also was inscribed in German that translates as: “I think the memory will please you” – I can’t be sure if it was written by Ursula or someone else. Finally, because the parties were so nicely identified, I was able to “recognize” Ursula in two other unlabeled photographs that I had – a very happy discovery. Much of Ursula’s story might sound familiar if you’re following along with these weekly posts – her son, my great-grandfather Joseph Bergmeister, also known as the boy with the mischievous grin and the thumb in his vest, was profiled in Week 5 (“Plowing Through”). Her daughter, Hilaury Bergmeister, or Lari, the one who probably instigated something with Joseph to cause that expression on his face, was profiled in Week 7 (“Love”). Ursula Dallmeier (also spelled Dallmayer or Dallmaier) was born on 21 September 1846 in Prittlbach. Her father, Joseph Dallmeier, was a farmer-turned-innkeeper. Although a farmer at the time of Ursula’s birth, around 1850 the family would move to the town of Asbach where Joseph bought the local inn. 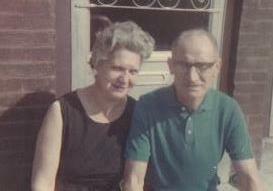 Ursula was living with her parents in Asbach when she met her first husband, Joseph Bergmeister, who was a flour merchant. Their first child, Hilaury, was born in January 1870. Although illegitimate, the father was named in the baptismal document and the couple married the following year on 11 April 1871 in Pfaffenhofen an der Ilm. Ursula’s husband Joseph was likely a traveling merchant, because they move frequently in the next several years. In 1871 the family was living in Vohburg a.d. Donau when a daughter named Marie was born, but the baby did not survive. In 1873, Joseph was born in Vohburg. In 1876, Ignatz was born in Abensberg. 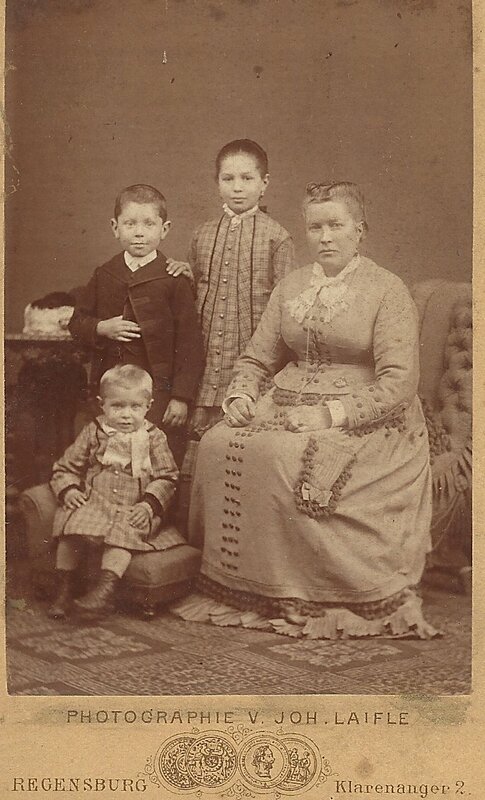 By 1879, the family appears to be living in Regensburg based on the photograph above. Sometime after Ignatz’s birth and 1884, Joseph Bergmeister died. Ursula got married again to Herman Götz, a steam engine driver, and had more children: Herman in 1885, Julius in 1886, and Elsa (birth date not yet known). Received your card with great joy. Thank you. Did you receive mine? Mother is very sad because you have not responded in so long. She is ill. Hopefully you are all healthy. The weather here is bad. Please respond as soon as you can. Sending you warmest wishes and kisses, your sister Elsa. Many greetings from your mother. Ursula passed away on 21 January 1911 in Regensburg. She was 64 years old. The photo she left behind of the first half of her family certainly pleases me. Children: Hilaury Bergmeister Thumann (1870-1943), Maria (1871-1871), Joseph Bergmeister (1873-1927), Ignatz Bergmeister (1876-1919), Herman Goetz (1885-1918), Julius Goetz (1886-1971), Elsa ? In this series, Ferdinand Müller, a German-born naturalized U.S. citizen living in Philadelphia, has returned to Germany in 1912 for a trip. Along the way, he writes to his friends back home, Max and Laura Thumann (my great-aunt). This week’s card is dated two days after trip to Coblenz. Back: Ferdinand has a lot to say, but unfortunately nothing about his visit to the castle! Offenbach a/m. September 20.12. Friend Max and Lary. I already purchased my return ticket and will go on October 26 on the Graf Waldersee from Hamburg with Franz Hahlm also. I think we will take a cabin. The weather is better now, previously it was always cold and rainy. I will go next Sunday to Bavaria by car. Greetings, Ferdinand. Sending a bundle of newspapers English (cut off, not legible). Respond soon. Ferdinand has already set his return date – five weeks away on October 26 he will board the steamship Graf Waldersee in Hamburg with his friend Franz. In the meantime, weather has improved and he’s going to Bavaria soon. But Ferdinand fails to mention anything about view on the front of the card, the beautiful Burg Eltz. He must have visited the site on his way back from Coblenz, the last card he sent. It’s too bad we don’t get his impressions of it. Unlike some of the other places he’s been so far, this one was unharmed by the Second World War and looks much the same as it does on this card…which is much the same as it’s looked for centuries! Burg Eltz has been owned by the same family for 850 years – that’s 33 generations. It is one of three castles on the left bank of the Rhine that were never destroyed over the centuries. The castle (or parts of it) is open to the public for tours and, luckily for anyone that is in Germany or will be soon, it just re-opened for the season two days ago. In this series, Ferdinand Müller, a German-born naturalized U.S. citizen living in Philadelphia, has returned to Germany in 1912 for a trip. Along the way, he writes to his friends back home, Max and Laura Thumann (my great-aunt). This week’s card is dated the day after his car trip to Burg Rheinstein as he drives back along the left side of the Rhine. Front: The Kaiser Wilhelm monument in Coblenz. Back: No time to write! There is slight confusion over Ferdinand’s handwriting on this card. My cousin was not sure about the word after schreiben (write) but I think it may be the elusive friend referred to as Schwörie. This would make sense if the message is he had no time to write at the memorial where he bought the card and he’s telling his friends that he is now in Bad Ems, quite close to Coblenz, with Schwörie? If you’ve never heard of the town of Coblenz, that’s because the spelling was changed in 1926 to Koblenz. Situated where the rivers Rhine and Mosel meet is the monument to Kaiser Wilhelm, who, as we’ve learned from several of the monuments visited by Ferdinand thus far, was celebrated for the unification of Germany in 1871. The monument was built in 1897. The equestrian statue of Wilhelm was designed by a sculptor named Emil Hundreiser who was a student of Rudolf Siemering whose work we’ve met earlier in Ferdinand’s trip. The quote on the monument read:”Nimmer wird das Reich zerstöret, wenn ihr einig seid und treu” (Never will the Empire be destroyed, so long as you are united and loyal). In 1945, an American artillery shell hit the monument and its remains were removed shortly thereafter. However, in 1993 – nearly one hundred years after the initial statue – a replica was inaugurated. It still represented German unity – only this time as a result of the fall of the Berlin Wall and the unification of East and West Germany. 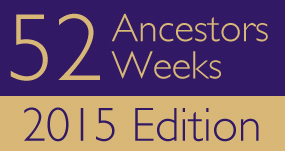 The theme for Week 12 of the 2015 edition of the “52 Ancestors in 52 Weeks” challenge is “Same” and my ancestor is my 3rd great-grandfather, Ignaz Echerer. In modern times, Ignaz might be called “Junior” – for he had a lot of the same details of his life in common with his father. Ignaz Echerer was born on 21 Dec 1803 in Pfaffenhofen an der Ilm, Bavaria. 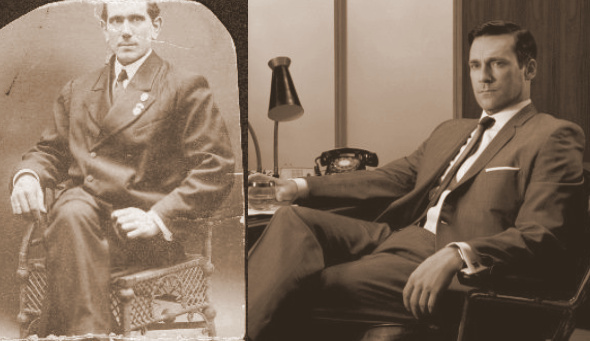 A lot of the facts of Ignaz’s life are remarkably the same as his father, and the similarities begin at birth. First, they have the same name – both are named Ignaz Echerer. Next, they were both born in the same house in Pfaffenhofen. Today that address is called Löwenstraße 14. From 1810 to 1861, house numbers were used in lieu of numbered street addresses, so it was house #55. Prior to the official mapping of the town in 1810, the same house was known as house #67 in the 2nd quarter. But, no matter what you call it, the house was the same structure. The street (formerly called Judengasse), is located a block away from the main hauptplatz – or the town square. Ignaz (the younger) would later move in 1847 to a different house. 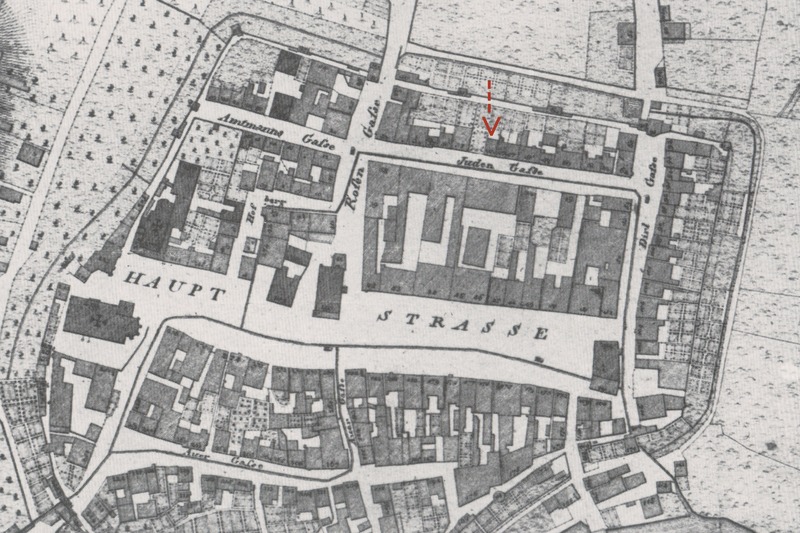 Portion of an 1810 map of Pfaffenhofen an der Ilm – the house of Ignaz Echerer is marked with the red arrow. The town’s church is in the lower left marked with the cross. As most sons in 17th through early 19th century Bavaria, young Ignaz followed in the footsteps of his father – no pun intended by that phrase, for his occupation was shoemaker! It was common to run the business for the craft in the bottom floor of the house in which the family lived, so Ignaz would have grown up learning the trade – just as his father learned from his father and grandfather. Ignaz (the younger) got married to Magdalena Nigg on 19 Feb 1844; he was 40 years old and the bride was 36. This was a common age for men to marry in that time and place, although the bride is slightly older than usual and explains why the couple did not have as many children as most couples, including Ignaz’s parents. This is one fact that is not the same as his father, for Ignaz the elder was about 31 when he got married. However, there is another marriage fact that is the same between the two men: both married a woman who was not only also from Pfaffenhofen, but both were the daughters of a different kind of craftsman. In my Bavarian research I’ve found that brides were often daughters of the same craft but from a different town. In other words, both men might have married a shoemaker’s daughter from a neighboring town. Instead, Ignaz the elder married the daughter of a glassmaker in town, and their son Ignaz married the daughter of a carpenter in town (profiled in Week #10). The entry in the marriage index for Ignaz Echerer and Magdalena Nigg. Note the look of the name “Echerer” in German Sütterlin script. Ignaz and Magdalena had at least three children. Unlike his father, he didn’t give his son the same name, but instead named him Karl, quite possibly after his father-in-law. Ignaz died on 01 Feb 1874 at the age of 70. His wife lived another four years. I can’t say if Ignaz had the same life span has his father, because I haven’t found his parents’ death records. One great thing about this 52 Ancestors challenge is that I’m finding out where my research could use some additional re-search! The Echerer line in Pfaffenhofen was the very first ancestral line I “found” – but as a beginner I didn’t document my facts as well as I should have. Not to mention that those were the days before you could make a digital copy of the records you found. Ignaz Echerer and his father has a lot of things about their lives that were the same: same name, born in the same house, born and likely died in the same town where they lived their entire lives. They were both shoemakers, and likely worked side by side in the same shop. And they both married women in the same town who were daughters of non-shoemakers. They also had many things that were different though – the elder Ignaz lost his own father when he was only 13. He also got married younger and had more children, and quite likely died in that same house in which he was born. I wonder if their personalities were the same or if they were polar opposites? Ferdinand sends a much longer message than his last postcard, but given that it’s the same exact day he can be forgiven for his brevity last time! He is once again taking a car for day trips from Offenbach, which is located just outside of Frankfurt. In 1912, I doubt that cars were common. How refreshing a car trip along the Rhine would be without hundreds of other cars doing the same! He writes again of “Schwörie” who is apparently a mutual friend. He mentions possibly returning home on the Graf Waldersee on October 26. Will he? Stay tuned… Also, in this postcard he sends his greetings to Laura’s (half)brothers, Julius and Herman Goetz, so he likely knew them as well. No mention of her brother who is my great-grandfather though! Map of some towns along the Rhine river. Today’s trip takes Ferdinand to one of the marvelous castles along the Rhine, Burg Rheinstein. Amazingly, the castle was constructed in the early 1300’s. However, after the Nine Years’ War in the late 1600’s, the castle was left in ruins. It was rebuilt from 1825-1844 thanks to Prince Frederick of Prussia. Although it is privately owned, it is open to the public for tours. It is rather impressive even if it’s not the original (then again, would I really want to walk around in a 700-year-old-castle that’s perched on the side of a cliff?) I hope to visit it on my next trip to the Rhineland. 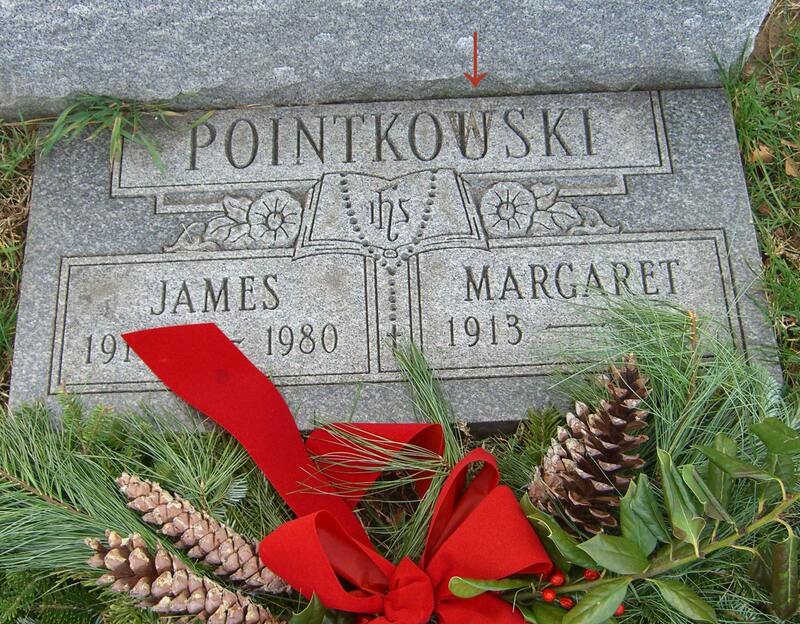 The theme for Week 11 of the 2015 edition of the “52 Ancestors in 52 Weeks” challenge is “Luck of the Irish” and my ancestor is my 5th great-grandfather, Jakob Zinsmeister. As you can probably guess by Jakob’s name, he wasn’t Irish. My challenge for this week was the fact that I have zero Irish ancestry. I realize that these weekly themes are “optional” but for me, they aren’t – that is what makes it a personal creative challenge. I’ve been writing about more than 52 ancestors here for the last seven years; finding a story that fits makes it fun. The English major in me wondered what the phrase “Luck of the Irish” means and where it came from. According to that super-reliable source, the internet, half of the sites say the phrase came about due to the luck of Irish immigrants in surviving tough mining work. But just as many sites insist the phrase is meant in a more sarcastic or even derogatory tone meaning that the Irish are the unluckiest people in the world. My Bavarian ancestor, Jakob Zinsmeister, had what I would call a rather unlucky demise. So, depending upon your personal view of the phrase, he either had the luck of the Irish or could have used some! Jakob Zinsmeister was born around the year 1741, probably in the small town in which he spent his life, Puch, near Pfaffenhofen an der Ilm in Bavaria, Germany. Although some church records date back to 1612 for the town, the birth records from 1690 to 1764 are not available. Therefore, I do not know Jakob’s birth date or his parents names. Jakob married Josepha Mair and they had at least four children that lived to adulthood: sons Konrad and Andreas, and daughters Kreszens (my 4th great-grandmother) and Franziska. Jakob was a farmer in Puch – the town is so small that it was either a very small farm or he was one of the only farmers in the town. Death of Jakob Zinsmeister from the Catholic Church records of Puch, Pfaffenhofen, Bayern, Germany.